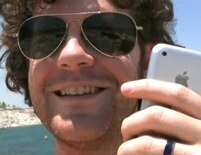 Geoff talks about ringtones on the iPhone and how it means something different to each person. For some it is just what it says it is – a tone that rings which tells you that your phone is ringing and that’s cool. For some it is a clip of a song from some artist they like – but why stop there? The whole idea with RingtoneFeeder is to make a ringtone whatever it can be – all of the above and more. A traditional instrumental tone is totally cool but we also love the idea about making a 15-20 second song that is actually made only to be a ringtone. Geoff spent some time trying to figure out what would sound good on these little phone speakers and how to make a song that is also going to be heard as a ringtone – after all unless you put your iPhone on vibrate you really do want to hear when your phone rings. The ringtones from Ringtonefeeder ranges from the funny, tongue-in-cheek type of ringtones to the more serious and traditional tones but common for them all is that they are made to be ringtones and optimized to sound great on your iPhone and all delivered automatically via iTunes . We like to try new things each week and would like to see how far we can stretch the concept of a ringtone so join the hottest ringtone community keep the great feedback coming. – and if you haven’t already – subscribe today and get the latest 10 releases at just $1.98 per month or try out the free feed directly in iTunes.